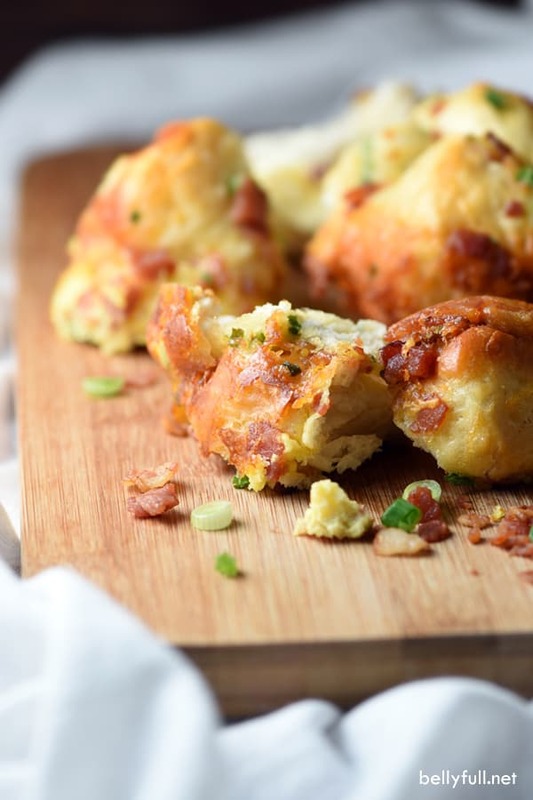 In this easy Breakfast Pull-Apart Bread you can have your eggs, bacon, and toast all in one! 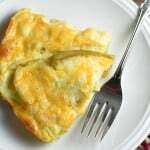 Other Breakfast ideas you might like! 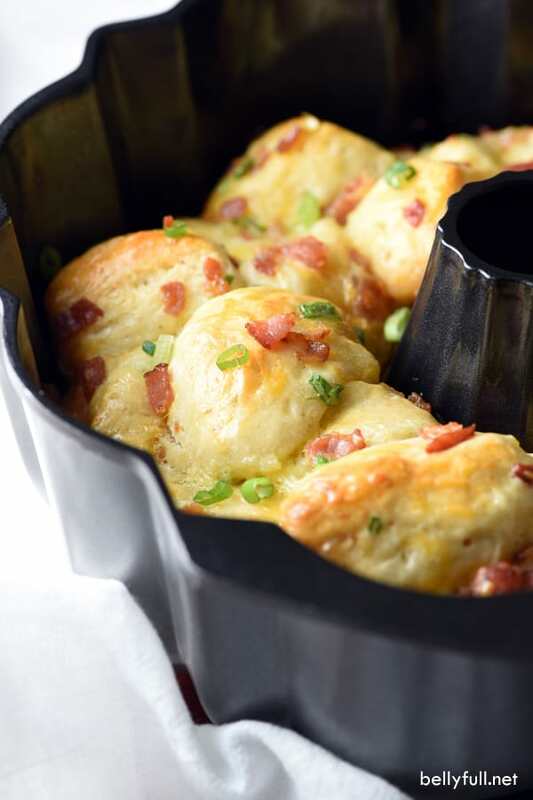 Have eggs, bacon, and toast for breakfast all in one with this delicious and easy pull-apart bread! Put the butter in a nonstick bundt pan coated with cooking spray and let it melt in the preheating oven. While the butter melts, cut the Grands biscuits into quarters. In a bowl, gently toss the biscuit pieces, cooked bacon, eggs, both cheeses, and scallions together. Once the butter has melted, give the bundt pan a little swirl so the bottom is evenly coated. Add the biscuit mixture to the pan, sprinkling with any cheese and bacon pieces that get left behind. Bake for 25-27 minutes or until golden. Run a dull knife around the edges of the pan to loosen. Turn out on a dish and enjoy! I don’t have a bundt pan. Is there something else I can use? You could try using a 10-inch springform pan or maybe a 9×9 baking dish? There are tons of recipes in regular pans that use precooked bacon as well. I saw those after I bought the stuff for this one. I buy frozen Pillsbury Grands. Would they work if I let them thaw then cut them up? There isn’t any half n half. It doesn’t need it. 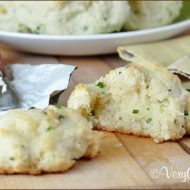 We do not have Pillsbury Grands in our area, could I use just the regular country style biscuits (what we have in our grocery store)? if so would I have to increase any of the other ingredients,? like more eggs, butter. Hi Alle – the egg mixture is completely raw when it coats the biscuit pieces and goes into the oven. And then gets fully cooked. You can view the video right above the printable recipe card for a visual. 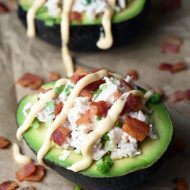 This looks delicious – I see in the other comments that people mention half and half, but it’s not listed in the recipe? Hi Glenna! I used to whisk in a few tablespoons of half-n-half with the eggs to make them creamier, but it’s really not necessary, and since so many people were confused by it, I just took it out. But you can totally put it back in! I couldn’t say, Ann. Sorry :/ Maybe find a homemade biscuit recipe and use that instead? Hi. The scones are more dense than these biscuits. Instead, you want to use a light yeast bread type of dough like for dinner rolls. Similar to French bread but sweeter. Your recipe look so tasty ! As I am living in France I would need some of your help to get the right ingredients wich are not available here. What is the Grand Biscuit and Half n half ? Hi Albert – Grands Biscuits are made by Pillsbury and are found with the refrigerated cookie dough at the grocery store. Half and half is a dairy product consisting of equal parts light cream and milk. Enjoy! I found my bundt pan (and a whole set of spring form pans) at my thrift store. The bundt pan didn’t have any scratches and it was cheap! You could probably use an angel food pan. After this I’m going to try making country biscuits and sausage gravy this way for my hubby! Your recipe calls for 2 Tbsp. half and half..what can I substitute for that item since we don’t use or buy half/half? DH uses 2% and I use FF Latose free milk..This sounds like a perfect idea for Christmas Morning for the family, along with their favorite french toast recipe and the mimosas and fruit. Hi Betty – the 2% should be ok, although I can’t vouch for the end result. And yes, your family will love it! Enjoy! i can’t get the grands pilsbury biscuits where I live anymore…all they have is the Cinnabon grands pilsbury cinnamon buns or the normal size biscuits (I know they are much smaller) any suggestions? Do you think the regular biscuits would work? I’m not that good in the kitchen And like to follow recipes…at a loss. Hi Marissa – hm. I can’t say without comparing the sizes, which I don’t have in front of me. If the smaller version is exactly half the ounces of the Grands, then you could probably just use two of those containers. Although, I don’t know if they have the same ingredients and will bake the same. And they might be too small to cut them in quarters. But you could try it! oh my god, how did I miss this – AMAZING!! Oh gosh, I don’t know. This was a popular one, for sure. Thanks, Heather! You’d love it! Would it be okay to cook the bacon ahead of time? Or even possibly mix all the ingredients (except for the biscuit pieces) the night before? I’m trying to prep as much as possible so that all I would need to do is add the biscuit pieces then throw in the oven. Hi Tam – it would definitely be ok to cook and chop the bacon ahead of time. And you could shred the cheese ahead of time. I wouldn’t, however, recommend mixing everything together early. But if you’ve got your bacon and cheeses done, it will only take you 5 minutes to whisk everything together. I’m sure this is a stupid question, but….Do you chop the bacon before or after it is cooked? I don’t have a busy pan. Is there something else I can use? Loved this recipe. I didn’t have a bunt pan, but it turned out fine in a well greased 8×8 pan. I did cut the butter by a couple of tablespoons since I didn’t have all the nooks in the bunt pan. Thanks for the recipe!! These were delicious!! I used double the bacon, cheese, eggs and half & half and cooked 8-10 minutes longer and was very happy with them..they went quickly and were loved by all. Thanks for a wonderful recipe! can you double this recipe in one bundt pan or would it be too big for the pan? Hi Cynthia – it would be too big. The dough wouldn’t cook through and also overflow. 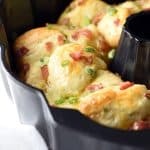 I live in the Philippines and we sadly don’t have any Pillsbury refrigerated products here :( Will I get the same results if I use homemade biscuits? Hi Wendy – I really couldn’t say for sure, since I haven’t made it with homemade biscuits and I don’t know recipe ingredients you would be using. You could try it! I used two eggs, extra cheese and 2 cans of regular biscuits, didn’t have Grands. The presentation was not impressive, mine stuck to the pan but it was DELISHIOUS! Will be making this again and again and again. Easy to put together and has all those breakfast items we love. Thanks for sharing this recipe. I guess I need to invest in a non-stick Bundt pan. Hi Barbi! Yes, definitely get a non-stick Bundt pan. BUT, did you coat the pan you used with cooking spray, per the recipe instructions? That should have helped it come right out. Glad you loved it! What type of pan can be used to still get the same effect, but in a smaller serving size? This stated serves 8-10, I’m looking more at a serving of 2-4, don’t want to be eating this for many days after. Hi Jill – honestly, it depends what and who you’re serving it for. My family of 4 polished it off for breakfast. But if you’re serving it with something else like scrambled eggs, it will serve more like 8. I’ve never halved the recipe and have always made it in a bundt pan, so I couldn’t really say and guarantee it will still come out. I find smaller tubes of Grands Biscuits at my store. Perfect for making a half recipe without wasting dough. Yum..
HA. Buy one…because you’re going to make this over and over again. But you can borrow mine for a test run! This looks very interesting, I look forward to trying this soon. I have never heard of these…………………. Oh gosh, Maxine…I have no idea. 8 biscuits come in a tube, so I guess you could search for a homemade biscuit recipe which yields 8? As for the butter, I went online to a conversion chart and it said 1 stick of butter is 113.5 grams. This recipe calls for half of that. Can I make this the night before and reheat for breakfast? Well….you could. But I wouldn’t recommend it. 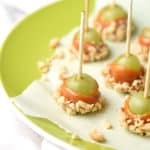 Wow, I cannot wait to try this next weekend…although with the fresh fruit you mentioned , it might even make a wonderful light dinner some night this week. I’m guilty of making it for dinner also…although there was no guilt. HA. Hope you enjoy it! This looks so good, great idea to mix in bacon & cheese! I’ve never used Pillsbury biscuits… I wonder if they are available around here (Ontario, Canada). This is such a great idea! This would be perfect for SO many things, too. And easily adaptable based on people’s personal tastes. Bring on weekend breakfasts! This is STUNNINGLY awesome. It might be the only thing I want to eat from now on. You’re brilliant. 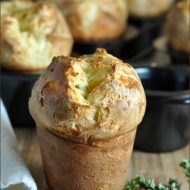 LOVE pull-apart breads! 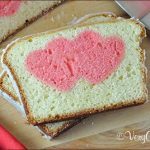 LOVE your savory/breakfast bread…this is fantastic, Amy!! Wow Amy! This looks absolutely fantastic!! Can’t wait to give this one a try! This is a brilliant idea! Like you breakfast during the week is quick, so I look forward to weekend breakfast time! Oh magosh that looks yummy! Oooo, this looks amazing! 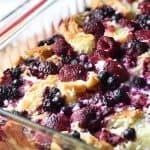 I’ve only seen sweet, sticky pull-apart breads..but this sounds so much better. Yum!!! I’m trying not to get too excited here, but I think you just saved my life in the breakfast department! I have two boys that always want eggs, and two more that always want pancakes or waffles. All of them always want bacon, because…bacon. I can’t wait to float this recipe past them! You need my address so you can send me that loaf … they have same-day delivery, right? I don’t blame your kids for not asking for the sweet stuff. I’m pick this first hands down. Pull apart breads are just irresistible! Ho-ly mo-ly. I want this so badly I can TASTE it this morning. This is so many things I love all in one dish! Oh I love this idea so very much! Is it wrong that I want to eat this whole thing by myself? My poor husband wouldn’t even get a bite…. OMG…this looks divine! How creative you are! Unfortunately I’m on a diet. Do you think the bundt pan be sprayed with a nonstick cooking spray instead of using the butter? Or maybe use a lot less butter, like a couple of tablespoons? Hi Maria – you could definitely coat the pan with cooking spray…but just know that the butter gives the outside a crispy texture and adds to the richness of the bread. It should still be delicious, but not as much. I only make exciting breakfasts about once a month, but I could definitely see this being a weekly favorite. By which I mean, the.boy will almost certainly request it for dinner. Daily. And I won’t blame him. Could this be made omitting the egg ? I do not like eggs at all. You could try it – maybe just increase the amount of half-n-half to 3 tablespoons. I can’t vouch for the result, though. Good luck! Thanks for your response…..I did try it without the eggs and it came out just fine. It was yummy! Oh wonderful, I’m so happy to hear that! Boy Howdy you kids were right on track in both desiring this bread. I am high fiving myself which is not the easiest thing to do, because this grand bread is the easiest thing to do. There is not doubt in my mind that it tastes as good as it looks. I’m in love! It’s breakfast with eggs that even Jordan would eat. Pinned! Mmm ok I can get behind this for breakfast!